This business capability map template helps you get started and create a complete overview of your business capabilities. See here capability mapping examples and model your business capabilities! See how IT and business go together and get a complete overview of your business capability landscape. Business capability modeling is a technique for the representation of an organization’s business anchor model independent of the organization’s structure, processes, people or domains. 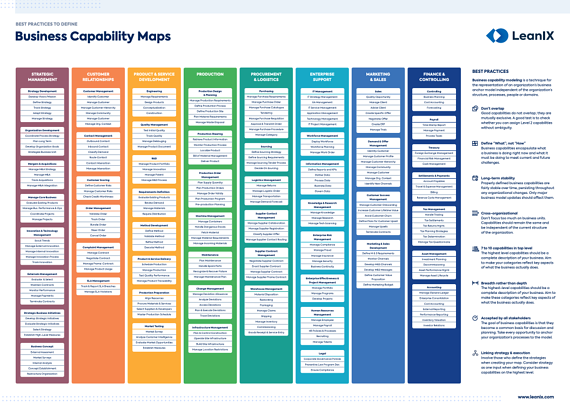 Whether you are from the banking or insurance industry, automotive or logistics industries or others, this generic business capability map is the perfect start point! Additionally, we have added tips and best practices on how to get started with business capability maps and to create a complete overview of your business capability landscape. Just fill in the form to get your business capability map template and best practices poster.